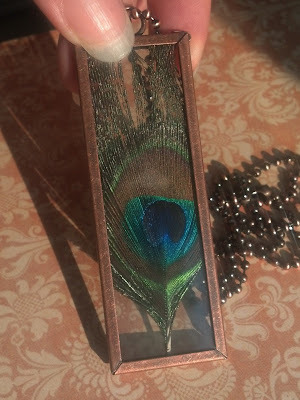 Here is a quick fun little project using Memory Glass and Memory Frames! I trapped a peacock feather between two pieces of Memory Glass, temporarily secured with tape. (just a couple small pieces of tape to keep the glass and feather in place). I trimmed the feather so that no part of it extended past the glass. I then carefully inserted the glass sandwich into the memory frame while removing the temporary tape. Tah-Dah! Quick and easy pendant gift! This project took less than 10 minutes to complete, and looks pretty fabulous! You are such a rock star!! Look how clever, so fabulous and so fast!! My kind of project! Very cool, Saundra.